E-health communities, also called Web-based health communities, have become popular arenas for support and sharing of experience, knowledge and advice among patients and citizens. 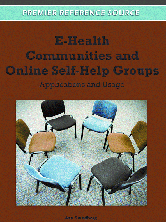 E-health communities are used on a day-to-day basis by people who help each other cope with different health conditions and learn together about health-related issues and behaviors. Blogging: A New Tool for Coping and Accessing Psycho-Social Support for People Living with HIV? European E-Health Framework: Towards More “Patient-Friendly” Healthcare Services?